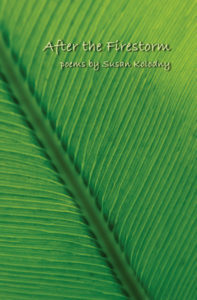 Susan Kolodny draws on her work as a clinical psychoanalyst in her first collection of poetry, After the Firestorm. Kolodny’s evocative style arises from an imagination both sensory and analytical. The poems suggest the unity of love and suffering, and walk a difficult line between the pleasures of the physical world and its dormant, invisible dimensions. Kolodny is a brilliant observer of nature, at once attentive and inquisitive, whose haunting questions provide a starting point for her lyrical investigations into the losses and traumas we all experience. on the peony, the lilac green and sticky. a thousand dead moths of bougainvilla. have gone back into the earth. study the resurgence of the lilacs. or when we look away? 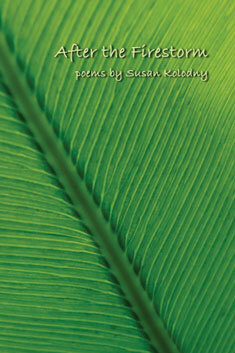 Susan Kolodny specializes in work with artists and writers. Her previous book, The Captive Muse: On Creativity and Its Inhibition (PsychoSocial Press, 2000) is a study of the psychological obstacles to creative work and the personal qualities and therapeutic work that enable people to surmount these. Kolodny, an urban nature poet, witnessed the devastating Oakland-Berkeley Hills firestorm of 1991, the subject of the title poem of her new collection.